Reality Clash is an in-development mobile AR shooter that integrates blockchain, cryptocurrencies, dynamic in-game advertising, and geo-mapping technology into the gameplay experience it offers. Yes… there are a lot of tech buzzwords in that opening line. We’d only need to throw in AI and VR and it might seem like a parody of contemporary marketing parlance. But in truth, there’s often a meaningful reality hidden somewhere behind the hype of headline-grabbing tech trends. And it just so happens that Reality Clash offers a fascinating working example of a potential that has been talked about for many years now. Namely ‘crypto-gaming’. As a piece of entertainment, Reality Clash offers an AR first-person shooter set in a future where hackers and cryptocurrency are reshaping the world around them. 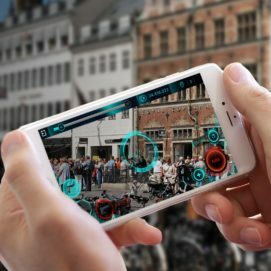 Thanks to its additional use of geo-mapping technology, this means players can essentially use their mobile phone as a portal to turn the real world around them into a game environment. Perhaps you’re taking a walk through a city? Open up the game, point your phone’s camera at the buildings around you, and on the screen you’ll see that the real world is draped in the visuals of the game. Certainly, the approach is comparable to how Pokémon GO! placed collectable monsters in real locations, but here we’re talking about something a few degrees more ambitious. You can even visit ‘safe houses’ in the game, which will guide you to real retail locations where you can secure discounts through play. Additionally, AR adverts laid over the game world will provide both access to special offers and the ability to mine in-game resources that can be used to build in-game weapons. The impact on ad tech alone is potentially very powerful. Last week TheGamingEconomy looked at contextually relevant adverts placed appropriately in game worlds. Now that can spill over into placing digital advertisements over real-world inventory, while tailoring those placements to individuals and the worlds through which they see them. On top of all that, players can use the specially created cryptocurrency of ‘Reality Crash Coins’ (RCC) to buy, sell, and trade weapons in the game world, offering the potential to earn real money. The blockchain’s role? As a smart, decentralised ledger that constantly and instantly updates in all locations, it assures that players’ ownership of digital items is meaningful, and that those items are limited in number, and not replicated elsewhere. And, of course, as well as underpinning Reality Clash, the blockchain makes up the game’s narrative. 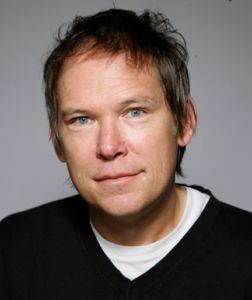 To learn more about the title, and the opportunity it encapsulates, we had a quick catch-up with Tony Pearce (pictured below), co-founder and CCO at Reality Gaming Group, which is developing Reality Clash. TheGamingEconomy: Purely in terms of the experience of the player, what role does blockchain and cryptocurrency play? Tony Pearce: Players will only directly engage with the blockchain if they choose to become virtual arms dealers on the Reality Clash marketplace. All weapons are tokenised at sale, with weapon data and ownership registered as digital assets on the Ethereum blockchain. These items can be bought, sold, or transferred on the online trading platform, whilst the tokenisation of these items secures ownership and maintains scarcity. As we progress, we’ll be looking at additional items that can be tokenised, but will strive to maintain the rarity of the current stock of weapons on the marketplace. Reality Gaming Group COO & Co-founder Tony Pearce. We believe that, at this stage, it is important to present blockchain utility as a choice rather than forcing gamers to engage with something that they don’t understand. This is why players of Reality Clash can choose not to interact with the trading side of the project and simply play the mobile game. What advantages does that bring to you as a studio, not constrained to the older model of selling items for traditional currencies? One of the major benefits for us as an indie studio is the flexibility that this provides to users of our marketplace. If they wish to pay with traditional fiat currencies, they can do this. If they wish to experience the world of cryptocurrency then they can purchase the RCC – our cryptocurrency token – from our website or from trading exchanges such as blockexmarkets.com. The RCC can be bought and sold on multiple exchanges allowing our traders to profit from item trading. 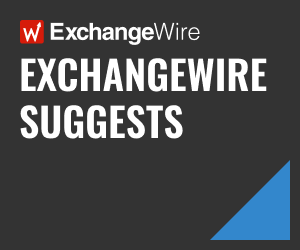 Not being constrained to just fiat currencies means we can reach a wider demographic of asset traders and, as a business, it is always beneficial to have multiple revenue streams. With the current model, we are able to generate income via in-app purchases, advertising/branding, as well as via our marketplace. Aside from the direct monetisation gains, how does this approach empower your studio’s ability to acquire users, and then engage and retain them? As a demographic, the current audience for blockchain games and collectibles is relatively small. These players are dedicated, willing to spend time learning about new technologies, new blockchains, and new games in order to try and make a profit. This empowers our studio with new users who are passionate about the technology and they are keen to spread the word to others. Another positive for both the studio and for players is the ability of these tokenised items to be used in other games. As our items exist as tokens, they can be transferred to any game that supports their use, as well as sold on other third-party marketplaces. What might the broader impact on the games industry be, with regard to the opportunity this particular implementation of blockchain technology presents? The majority of gamers are aware that their favourite games have in-house virtual economies. Gamers are becoming more aware that, with the advent of the blockchain and tokenisation, they can actually own the in-game item they buy. Currently, these economies are restricted in that your items must remain within the game and cannot benefit the owner outside of gameplay. Blockchain games will be a game changer. Games companies, such as Reality Gaming Group, have been tackling this by offering economies that allow the in-game items or collectibles to exist as an individual asset. This has begun with speculation, with users buying items that may return a higher profit in the future, but the real utility of blockchain collectibles is that ability to transfer items between worlds. We will begin to see items, such as those seen in Ready Player One, which can be used throughout game worlds and displayed in AR/VR platforms. The vision of the future Pearce paints is a captivating one, where digital items have real value, and move between games and other virtual spaces with us as individuals. Ready Player One might be closer than we think. And you can be sure TheGamingEconomy will return to this theme – and those beguiling AR billboards – very soon indeed.